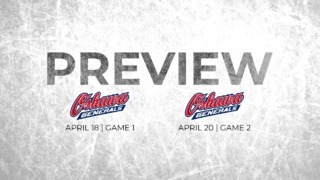 OTTAWA – The Ottawa 67’s came out on the losing end of a third-period shootout on Friday night, dropping a 5-3 decision to the Niagara IceDogs as the goals came quickly and often in the final frame. Riding a four-game winning streak, the 67’s opened the scoring in Niagara with Chase Campbell’s seventh of the season, before the IceDogs took the lead in the third with a pair of quick goals. While Niagara scored their third-period pair three minutes apart early in the final frame, the 67’s rose to the challenge as Noel Hoefenmayer, with his seventh, and Jared Steege, with his fifth, scored at the 12:10 and 12:40 mark of the third, respectively, to retake the lead. It wouldn’t last long, however, as the IceDogs responded with two more goals in 13 seconds to once again jump in front, as Ondreg Machala and Matthew Philip, with his second of the night, found the back of the net. 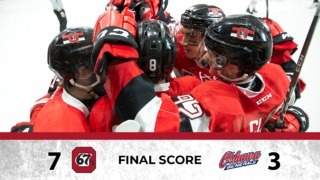 The 67’s got another huge performance between the pipes as Leo Lazarev made 40 saves in a losing cause, while Ottawa also sent 45 shots at the Niagara goal. After a scoreless first period in which Ottawa outshot Niagara 17-13, Campbell opened the scoring less than a minute into the opening frame. Just 23 games into the season, Campbell already has four more goals than the three he had last year. Aaron Haydon, who would score his second of the game with three seconds to play, and Philip scored before the midway mark of the third to put the Ice Dogs in front. 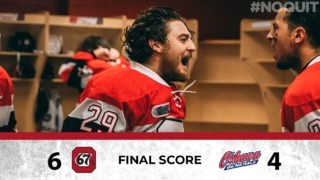 The 67’s next travel to Barrie to face the Colts on Saturday night before returning home to host the Windsor Spitfires on November 25 at TD Place.